The world of The Dervish house is a reflection of it's parent city of Istanbul which is itself a reflection of the nation of Turkey; ancient, paradoxical and divided like the brain of a human being. In the year 2027 on a swealteringly hot summers day there is a small explosion in Enginsoy Square, a minor bomb on the 157 tram - the only casualty the suicidal bomber who's head was wired to explode. Yet this everyday occurance will send shockwaves much further, resonating louder and ultimately effecting the lives of those around it in unexpected ways. Turkey of 2027 is the largest, most populous and most diverse nation in the EU, but also one of the poorest and most socially divided. It's a boom economy, the sweatshop of Europe, the bazaar of central Asia and the key to the immense gas wealth of Russia and Central Asia. This is the age of the carbon consciousness, each individual given a carbon allowance which has brought fourth a whole new trade. Those who can master the trading between gas prices and carbon trading permits can make a fortune, the old Byzantine politics are back. They never went away. Ian McDonald can be a very subtle writer at times, he manages to weave a tale that is ultimately about the people and places, managing to do so in such a convincing fashion that it can be some time before you realise the ideas he's transplanted within the messages and ideas he is really writing about. 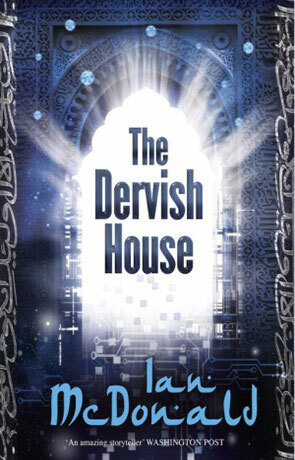 Such is the case with The Dervish House itself - a beautiful, old, middle-eastern style house designed around a central square with garden and water feature, a focal point to the story that weaves drama with conflict and intrigue with thriller, one central theme connected through three story strands that feature six main characters. Each of these characters is clearly delineated, lending strength to the literary style already present and notable for the pure quality of the prose. We are treated to a week in the ever so real lives of these characters as each change in some way in the after affects of the bomb. Each of these individual story threads would make up a novel in it's own right for many authors but here it creates something very special, a rich, confident and masterfully cultivated journey - joined together and culminating in a climax which makes excellent use of the underplayed science fiction elements. The main message here is about artificial intelligence and the natural progression towards artificial sentience, the "singularity" event that describes such a leap in technology and the dangers of nanotechnology popularised after Prince Charles coined the phrase "grey goo". I loved the inclusion of the "mellified man", a little known bit of history that hints at the research the author has gone to. My favourite though has to be the very idea that our own bodies could one day be living super, incredibly well thought out and a fantastic thought - although a computer crash or software reboot could be quite painful. I also loved the way that McDonald manages to bring each of the colourful characters that inhabit the book to life in such a manner that makes them uniquely human and ever so realistic. Part of the beauty is in the detail, managing to give little insights, foiables and characteristics about each without affecting the pace of the plot. The book has been nominated for just about every major genre award this year and has already won the British Science Fiction (BSFA) and the John W Campbell awards despite some very fierce competition. The Dervish House is simply sublime, an incredible novel by a literary genius that is by far one of the best novels of the last decade. Written on 8th August 2011 by Ant.